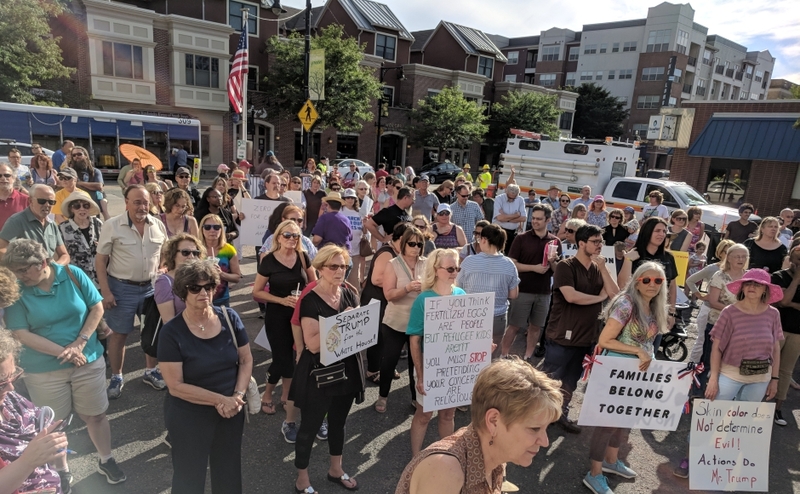 Protestors rally in Collingswood in support of families separated at the border by immigration enforcement officials. Credit: Matt Skoufalos. 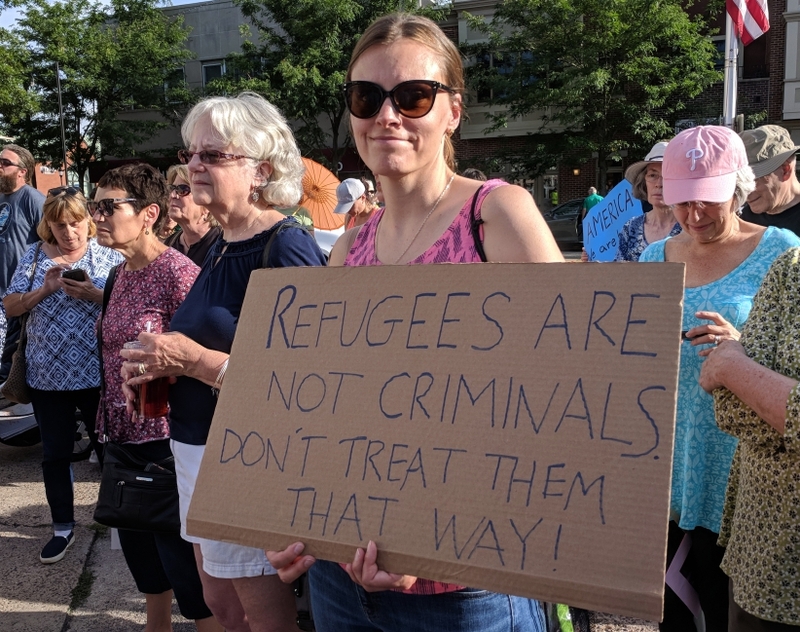 Some 200 people gathered Monday in support of refugees and asylum-seekers who have been denied due process under current U.S. immigration enforcement policies. NJ Pen Human Interest Reporting is Proudly Presented by Haddon Heights in Progress. Click for more info. 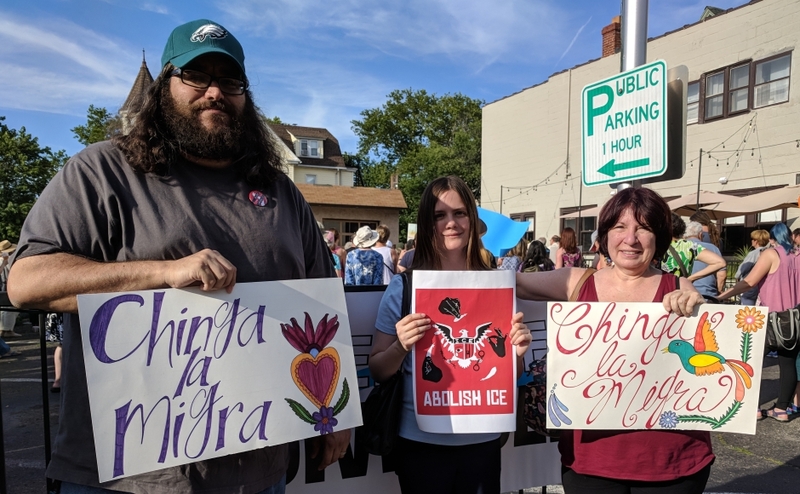 Protestors rallied in Collingswood June 25 in support of asylum-seekers. Credit: Matt Skoufalos. 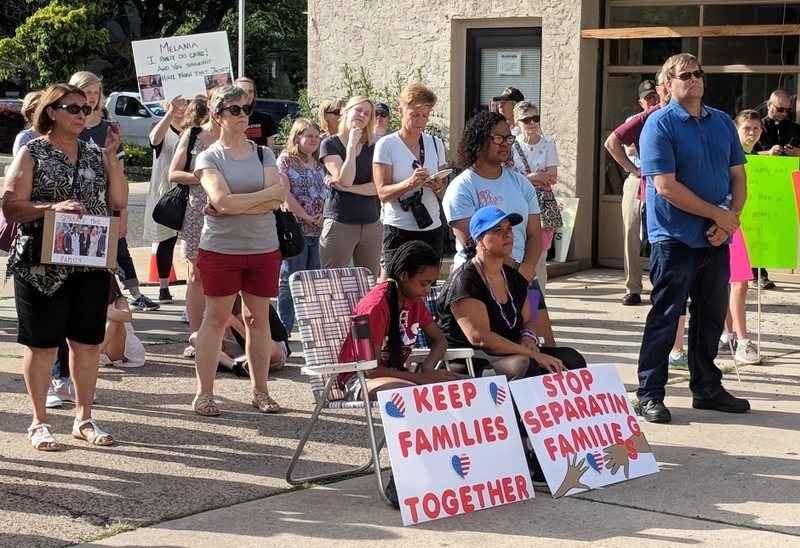 National critique of the Trump administration’s zero-tolerance immigration enforcement actions found a focus in Camden County Monday evening, as protestors gathered in Collingswood in support of refugees whose families have been divided at the border. Many carried signs criticizing the president, calling for the abolition of the U.S. Immigration Customs and Enforcement (ICE) agency, or simply calling for officials to “Keep Families Together,” the name of a U.S. Congressional bill that would reform the policing actions. Speakers addressed the crowd for more than an hour in the June heat, urging them to keep the pressure on elected officials to address what has become a human rights issue. Among them was Jeff DeCristofaro, executive director of the ‎Camden Center for Law and Social Justice. DeCristofaro, an immigration attorney who specializes in supporting undocumented immigrants, said the U.S. border crisis is driven by an intentional misreading of established law. Jeff DeCristofaro of the Camden Center for Law and Social Justice. Credit: Matt Skoufalos. Being in the United States without legal status is a civil misdemeanor punishable by a $250 fine and up to six months in jail. Even then, historically, it’s been unenforced to those limits. Under the Trump administration’s zero-tolerance policy, however, the same circumstance is being treated as a criminal violation. But refugees and asylum-seekers aren’t being given the due process of criminal defendants. “It’s a civil misdemeanor that they’re charging criminally, but people in criminal court have rights, the most important of which is being innocent until proven guilty,” DeCristofaro said. Because the U.S. border extends 100 miles inland, DeCristofaro anticipates that policing will spiral. As detention facilities are being overcrowded by the unprecedented enforcement, families are being split up throughout the country with no plan for reuniting them, and no information as to their whereabouts. “It’s a situation that’s been slapped together,” DeCristofaro said. Refugees at the southern U.S. border are fleeing all manner of political unrest in South and Central America, including gangs, government corruption, and domestic violence. Most importantly, DeCristofaro said, by arriving at the border in person, they are following a designated American legal process. As asylum-seekers, they are entitled to individual hearings on their cases, which the zero-tolerance policy violates. 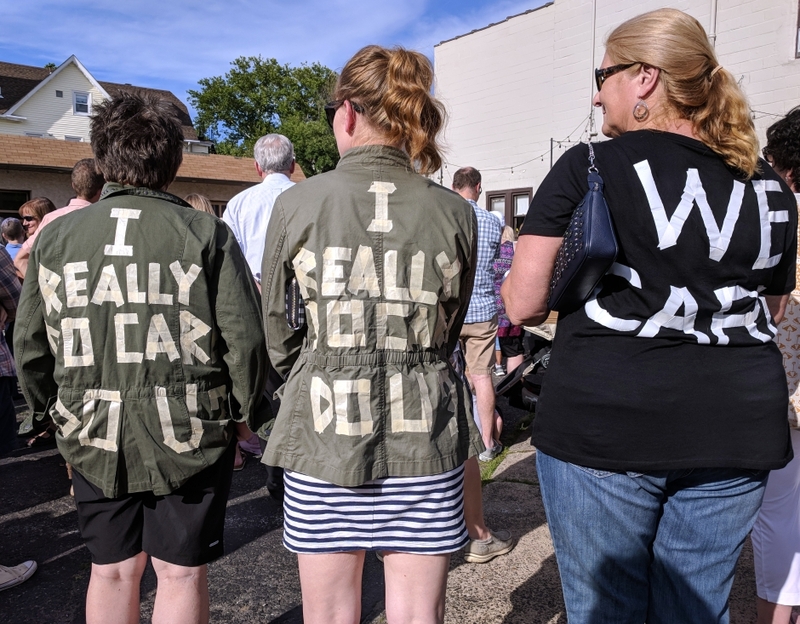 Protestors critiqued a jacket worn by first lady Melania Trump on a visit to immigrant detention facilities. Credit: Matt Skoufalos. The current enforcement action also exacerbates the political scapegoating of undocumented immigrants, DeCristofaro said. Popular myths, such as the lie that refugees get free social benefits, or that undocumented workers don’t contribute to the domestic economy, have made it harder to consolidate the political will to address the issue. “Folks that come here undocumented are not entitled to anything,” he said. “What they’re entitled to is their dignity. “Nationally, lawsuits are being filed, but the goalposts keep moving,” DeCristofaro said. He blamed the problem on “political cowardice. 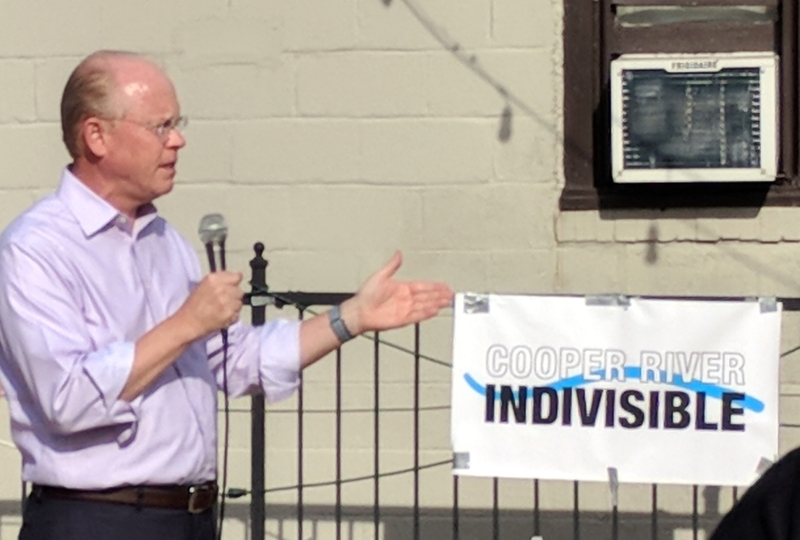 Collingswood Mayor Jim Maley speaks at a rally for asylum seekers. Credit: Matt Skoufalos. Collingswood Mayor Jim Maley said that the enforcement issue isn’t confined to the border, either. 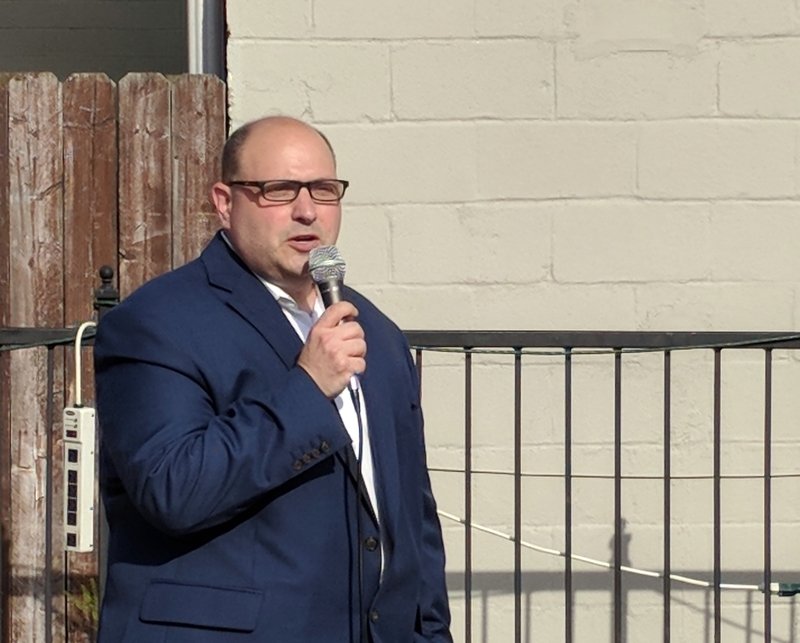 Last week, a longtime Collingswood resident and father of three school-age kids, was notified by immigration officials that he would be deported to his native Macedonia, the mayor said. Maley said the family, which has been in “a holding pattern during appeals,” has upheld its end of the process by checking in with ICE officials as routinely scheduled. On Wednesday, their father was detained, and last weekend, the government moved to expedite his removal from the country. Protestors from the Democratic Socialists of America rally in support of refugees at the U.S. border. Credit: Matt Skoufalos. The mayor said he’s been working with state and federal officials to intervene on the man’s behalf, and has no idea if any of it will help. Communication is so hampered that the family’s attorneys don’t even know if he’s been deported. “The net is scooping up everyone and their brother for no good reason in ways that will hurt the fabric of all communities,” Maley said. He urged the crowd gathered to “let the rage rage greater. 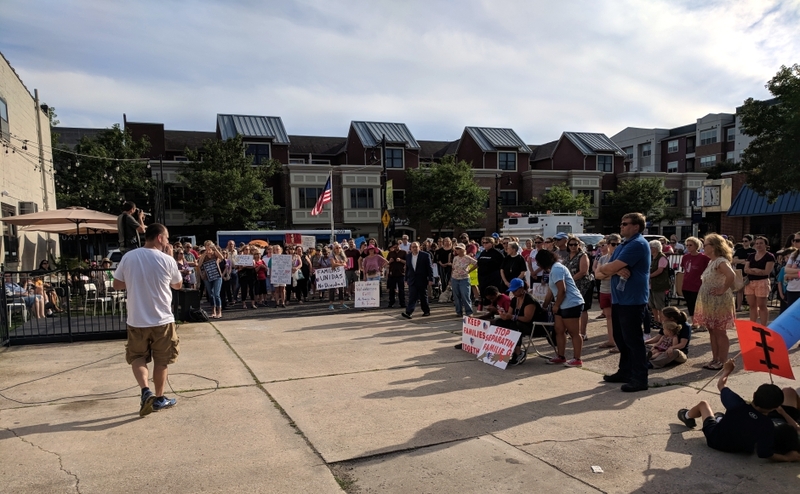 Keep Families Together rally organizer Adam Sheridan addresses a crowd of protestors in Collingswood. Credit: Matt Skoufalos. Rally organizer Adam Sheridan of Berlin, who put the event together through the group Haddon Indivisible, said he was motivated to gather support for the cause by his own immigrant heritage. “I have documented and undocumented people in my family tree,” Sheridan said. Like DeCristofaro, Sheridan urged protestors to keep contacting their elected officials to support the Keep Families Together Act. It would prohibit government officials from removing minors from their guardians as part of an immigration enforcement action unless there’s evidence of abuse, neglect, or human trafficking. “It’s going to take a sustained effort,” Sheridan said. 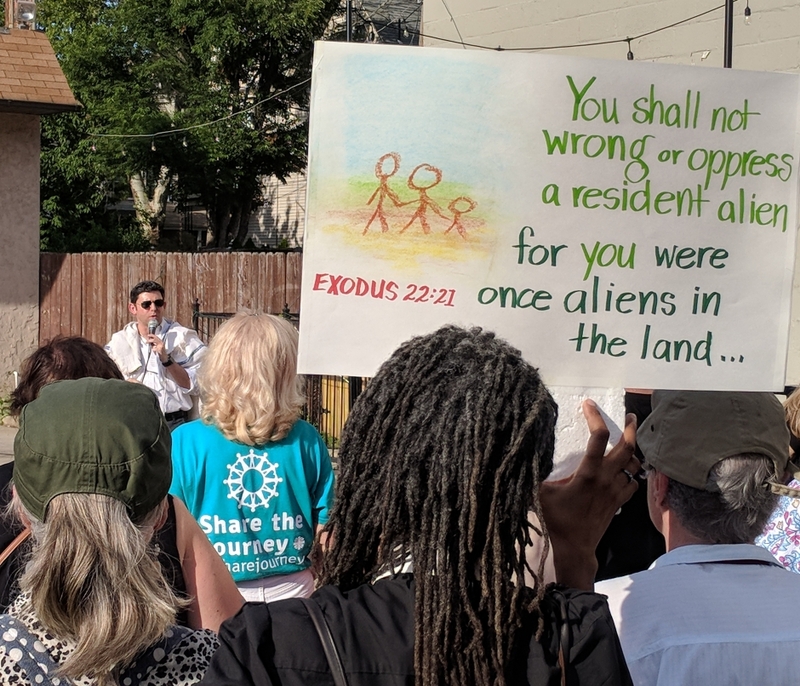 Rabbi Larry Sernovitz of the Nafshenu congregation of Cherry Hill addresses protestors at a Collingswood rally for asylum-seekers. Credit: Matt Skoufalos. Rabbi Larry Sernovitz of the Nafshenu congregation leaned heavily on scripture in his remarks, chastising U.S. Attorney General Jeff Sessions for his use of a Bible verse as a defense of the zero-tolerance policy. “[The text] says over and over and over: love your neighbor as yourself,” Sernovitz said. “That’s what it says 36 times in scripture. “It’s hard to believe this is the United States of America in 2018,” he said. NJ Pen is free thanks to regular, small contributions. Please support our work. Get e-mails, follow us on Facebook, Twitter, and Instagram, or try Direct Dispatch, our new text service.